Now the Convert PST to EML Freeware tool is the free way to manage PST files after recovering it from bad situation of Outlook. Users can easily download the software from the site and get the work done in no time. Apart from EML, this utility converts into many other standard file formats which is now supported by recognized email client like Thunderbird. Those file formats are MSG, PDF, MBOX, VCF, ICS, Text, Doc, HTML, MHT and EMLX. The software is a complete package and can do your work in the desired time and format. Besides this, tool is especially designed to convert password-protected and highly corrupted PST emails and other items. 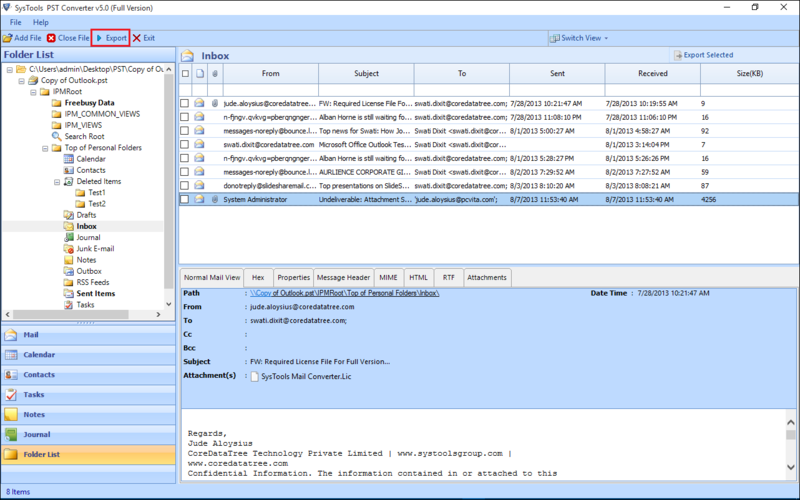 This convert PST to EML Freeware Tool provides perfect preview of emails, contacts, calendars, tasks, notes, journals, etc. before exporting them in the specific file format for the user convenience. So that user can check the files before saving them in their local disk. Convert PST to EML Freeware Tools has a unique feature of sorting by name. Users can easily sort the list accordingly. Download the tool and explore its unique features which are very different from other software of its arena.